I spent many happy years working with musicians and their music. I loved it. Some still know me as a former radio guy but there is a much deeper story. Radio – like every industry – has much more under the surface than those outside comprehend. Overseeing a radio station requires regular business stuff like budgets and talent development; promotional duties such as website management and database marketing; and external oversight on such items as advertising and event management. As part of my radio career, I worked in what is called the alternative rock format at two stations. Alternative is a distinction that carries as much negative connotation as positive reinforcement. The core of alternative music fans are rarely happy once a band gains even a modicum of success while those unfamiliar with the genre think it’s full of strange people with purple hair. It's important to note that both alternative radio stations continue to be successful measured against mainstream metrics. 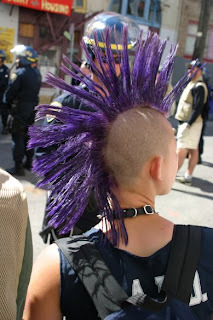 And perhaps with the exception of one year at Hallowe'en, I've never found the need to dye my hair purple. Not that there's anything wrong with that. I like purple and I digress. Can you be cutting edge and mainstream at the same time? In 1988, Michael Trent Reznor formed an industrial rock band called Nine Inch Nails - no doubt you’ve heard of them. Twenty-one years later they have sold millions of albums, CDs and downloads, played in front of massive festival and stadium crowds and won Grammy Awards. Despite this worldwide success, Nine Inch Nails and Trent Reznor remain categorized as alternative not mainstream. When NiN formed, there wasn’t the long list of social networking channels we have now. Today, Reznor has over 600,000 followers to his personal Twitter account and his band is well represented through their YouTube and Flickr spaces. In 2006, Jack Dorsey was looking for something that would kick start a creative slump for his company Odeo. His original idea was to create a conversation space through sms called my.stat.us. Today, Jack and his partners Biz Stone and Evan Williams, seventy-five employees in a modest San Francisco building and millions in venture capital have grown Twitter to one of the fastest growing web portals in the world with millions of regular users. From 1975 to 2009, Microsoft has grown from an idea Paul Allen and William Gates had to develop software for the microcomputer to over 90,000 employees in 100 countries and over $58 Billion in annual revenue. So is Twitter the alternative and Microsoft the mainstream? Whether you a musician and producer of industrial music, three geeks from Silicon Valley or the world’s largest software manufacturer, you have to start with an idea. It may be a concept yet to be adopted by anyone else, it could be quite different than the current mainstream thought, but if it’s a good one the audience will discover it. At that point, will it really matter what label we put on it?